It came in like a wrecking ball. Neptune has one of the weirdest collections of moons in our solar system, and it’s Triton’s fault. 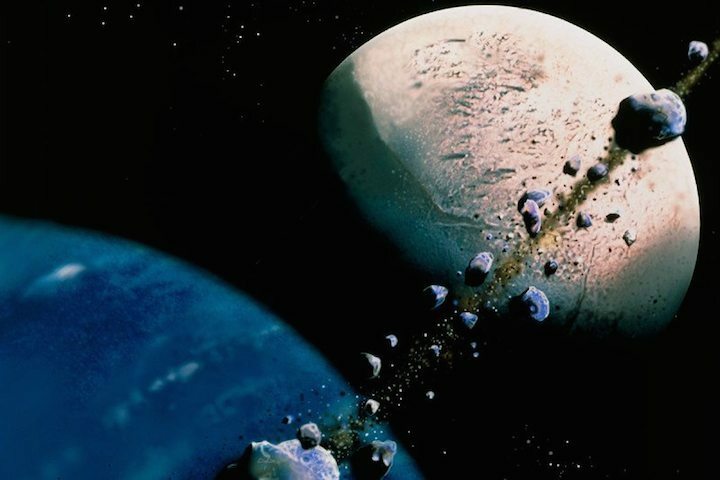 The planet’s largest moon probably smashed into the calm moon system that was there before it arrived, knocking everything out of sync. Planetary scientists have long suspected that the huge moon Triton is an interloper from outside the Neptune system. Now they have calculated what the other moons may have looked like before the intrusion. All of the other gas giants in our solar system – Jupiter, Saturn and Uranus – have fairly similar systems of moons. In each of these systems, the mass of the planet is about 10,000 times bigger than the total mass of all the moons together. For the most part, these planets have several small moons, all orbiting in the same direction as the planet spins. But Neptune is different. It has several tiny moons either very close in or far away from the planet – most of which orbit in the direction of the planet’s spin – and one huge one, Triton, orbiting in the opposite direction. Robin Canup at the Southwest Research Institute in Colorado and Raluca Rufu at the Weizmann Institute of Science in Israel used a series of computer simulations to figure out what the Neptune system was like before Triton barrelled in. They found that it probably had a moon system similar in total mass to Uranus’s. But that didn’t last long. To get from a serene Uranus-like system to what we see at Neptune today, three things have to be true: the early moons had to be small enough that they wouldn’t destroy Triton as it crashed into them; they had to somehow slow Triton down so that it would be captured in the relatively close and circular orbit that it has now; and Neptune’s outer moons had to remain intact. “The question is, how do you capture Triton in an elongated orbit and then get it into this circular orbit? You have to dissipate some energy from it to slow it down,” says Scott Sheppard at the Carnegie Institution for Science in Washington DC. Canup and Rufu found that Triton’s gravity flung the smaller moons around. It also collided with some of them, slowing down and settling into its circular orbit. This process happened fast enough to stop Triton from hurtling through the outer areas of Neptune’s system too much, leaving the moons out there relatively unscathed. “Now that we have some hold on what the original moons of Neptune were like, that can give us some clue as to what we should expect for extrasolar planets of that type,” says Matija Cuk at the SETI Institute. Unfortunately, it will be difficult to confirm the scenario that Canup and Rufu propose, even if we send a spacecraft to Triton to look. Triton is icy and seems to be geologically active, so ice is likely to have filled in any craters or scars from the moon’s past misadventures, says Sheppard.